BMSoftware are computer software and hardware resellers. We specialise in educational software including language learning software and religious education software. We are also IT and education consultants and able to advise on implementation of ICT, RE, and language, curriculum requirements. Our range of software-based language learning titles covers language teaching from primary school age through to sixth form. We can provide software for language acquisition in more than 60 languages from Arabic, through Latin, to Zulu. We can advise on multilingual word processing and DTP software in 165 languages including right to left languages such as Hebrew, Arabic and some Indian scripts. We can provide bilingual computer keyboards and on-site training. 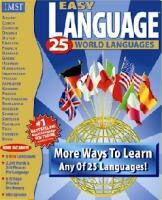 We also have European, Japanese, Arabic and Hebrew translation software and CD-Rom dictionaries. Some of our staff are linguists and can advise you on the best products from personal use. Our range of educational reference software includes philosophy, history, science, geography, literature and religion. Whether it's Microsoft Encarta, Encyclopaedia Britannica, Encyclopaedia Judaica, or the last 100 years of the National Geographic Magazine on CD-Rom/DVD we've got it. Hundreds of works of literature are available as electronic texts from Darwin's Origin of Species to the complete works of Shakespeare. We carry hundreds of religious education software titles that cover the three main faiths: Christianity, Judaism and Islam. Now you can search Torah, Bible or Koran, for verses on everything from Aaron to Zebedee. We have the largest selection in the UK of these resources and our staff are experienced in their use and have theological training. We also have books and other RE resources for classroom use. Just because we specialise in language and RE resources it doesn't mean we don't do more besides. We can provide software from a range of 2,000 titles and computer hardware from 16,000 lines. Whether its Microsoft Office or a million clip art images you're after we have it. For projects that need graphics we have general and subject specific clip art ranges and also the image editing and DTP programs to make best use of them. Explore words and phrases and discover essential vocabulary and pronunciation in 25 languages from Arabic to Zulu! BMSoftware are sponsors of The Educational Infomat Campaign for schools and colleges providing access for teachers, pupils, and parents, to safe sites and approved software. The Campaign aims to encourage Internet use within the national curriculum and is part of The National Grid for Learning initiative spearheaded by the Government. The Infomat.net website is being specifically put in place to act as a complete Information Network and filtering system that will allow education authorities, teachers, pupils and parents to communicate through one forum.